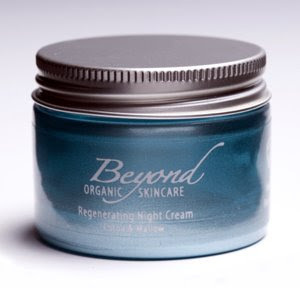 I have been using a range of certified organic products from the triple award winning skincare company, Beyond. Sea buckthorn features heavily throughout the range and Beyond are particularly interested in harnessing the unique properties of this wonder plant, since it “it is the only plant in the world known to include omega 3, 6, 7 & 9”. Beyond are proud to say their products “contain more than one hundred and ninety biologically active compounds”. But what is it like to use? Well, I can say first hand that Beyond have created a range that is quite different. Despite their complexity at molecular level and the clever combining of biological actives, I feel it is a range that has been ‘stripped back’ and is a range that loses all the unnecessaries and ‘fluff’. I think Beyond have focussed most of their attention on really goes on at skin level and it is this that I think makes it a very different product to use. Rejuvenating Serum – An extremely concentrated oil-based serum that has a most powerful aromatic quality. The essential oils, combined with some pretty potent plant extracts, is constructed to deliver anti-oxidants, vitamins and bio-active compounds to work deep in the skin and help cellular regeneration (great for mature skins). Verdict: As I said, a most lovely aroma and really only a few drops are needed to soften and comfort the skin and can be applied to all areas of the face and neck (including the delicate eye contour area). I wore this underneath the moisturiser but I really don’t think you would actually need to moisturise if your skin is not particularly dry. Although initially I was applying it morning and night, I soon realised that I didn’t need it during the day, so used it only at night after cleansing. Generally, the serum leave’s the skin soft and supple with a satin-like look and feel and lovely healthy glow. Firming Eye Cream – This is a light, unfragranced cream, containing soothing eyebright (a fave in eye products because it is renowned for being helpful in reducing puffiness), anti-wrinkle rosehip and toning cornflower. Verdict: The smallest, most teeny, weeny amount is needed and it really does cool and soothe the eye area and absorbs fantastically. It is really good to use in the morning as it really helps to give the eyes an ‘I’m awake!’ look. Moisturising Day Cream – Containing a powerful combination of minerals, fatty acids and vitamins A, B1, B2, B6 & E, this is a skin-loving preparation that has been designed to create a protective moisture barrier. It also contains soothing rose and cell regenerating seabuckthorn oil, so is a clever synergy ideal for sensitive, dry and mature skins. Regenerating Night Cream – This award winning, incredibly rich cream contains cleverly blended bio-active compounds and is fortified with rosehip, seabuckthorn and macadamia nut oils. They works hard and in harmony with each other to help replenish and rebuild skin tissue. Verdict: It is using the moisturisers that really demonstrates how Beyond strip back and get down to the real nitty gritty. This is no-fluff, extreme skin care. Verdict: The moisturisers are different to apply and have a different skin feel. I have to honest, upon first application, they just didn’t behave like I expected a cream to. They were richer and, particularly true of the night cream, denser. Unlike creams that I am probably more used to, spreadability was somewhat reduced. Was this a problem? Well, after all the cream had absorbed and my skin felt AMAZING, I soon realised that this cream could not be treated like most others. It is different because it is no-fluff purity. It would not contain substances to help improve spreadability or speed up absorption. This is bare bones skin food (and boy, does this stuff deliver). Anyway, I found that by applying a small amount to each fingertip and tapping my fingertips over my face, a few light-touch strokes to evenly spread the cream and then a press-and-role action with the flats of my hands, the delivery is perfect and the skin feels alive from the massaging action. Overall Summary: I just love how these products love my skin. Mine is not a particularly dry skin but I still have been blessed with fantastic results from using it as my skin feels enveloped in a comforting veil. I think if you are going to use the range for the first time, forget what other products feel like when they are applied. This is unique. If I am honest, I think I have developed a bit of an addiction because I love how my skin is looking and feeling (especially in the morning after using the serum and night cream the night before). A Final Word: The Beyond range is broad but product choice very simple. There is something for everyone (including a range aimed at professional salons and spas). You can visit the Beyond Skin Care website at http://www.beyondskincare.co.uk/ or call 0845 500 3550 (local rate) for sales and enquiries. Tip! Try their Weekender kit £21.60, that contains all the products reviewed here and I would reckon that it would last a good 2-4 weeks of daily use, which I think is truly excellent value for money.